Product prices and availability are accurate as of 2019-04-11 23:19:26 EDT and are subject to change. Any price and availability information displayed on http://www.amazon.com/ at the time of purchase will apply to the purchase of this product. DietMaster 2100 V11 is like having your own private nutrition counselor! Enter your personal profile to calculate your calorie needs and select from ready-to-print cancer prevention meal plans and grocery lists designed by our team of registered dietitians. 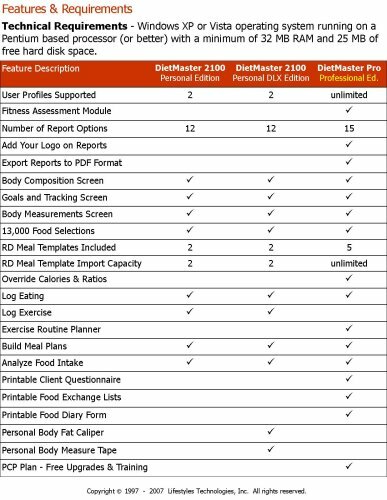 DietMaster 2100 also provides you the ability to analyze your eating habits to identify caloric intake and nutrient deficiencies. Set your goal weight and estimate the date you will reach your goal. Track your body symmetry measurements including arms, shoulders, waist, hips, thighs and more. 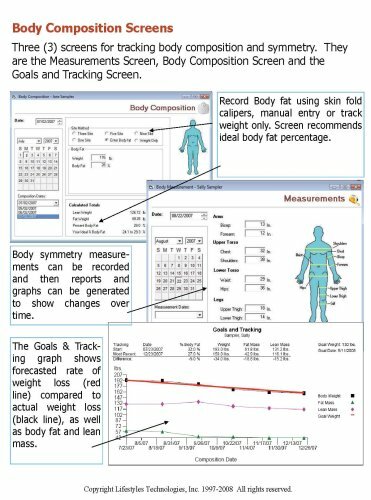 Use the Body Composition screen to save historical body weight and body fat data and graph progress over 3 months, six months or one year. The new DietMaster 2100 Plus edition includes a Fitness Assessment Module for evaluating ones overall fitness condition including cardiovascular, flexibility, strength and body composition. A note from our Registered Dietitian: The Cancer Smart Templates are for people who are serious about taking preventative steps in the area of nutrition to help lower their risk for cancer. These menus contain loads of plant-based foods; are low in saturated fats yet moderate in unsaturated fats (the healthy fats); rich in calcium and moderate in sugar and sodium. These templates are full of fruit and vegetables, which according to the American Institute for Cancer Research (AICR) are rich in substances that help reduce the risk of cancer, heart disease and other chronic diseases like diabetes. These templates are also high in fiber and whole-grains and contain soyfoods, which may help to fight some forms of cancer. IMPORTANT: DietMaster 2100 Plus editions are not designed for professional use. Certain personal profile information cannot be changed once entered (e.g., birth date and gender). 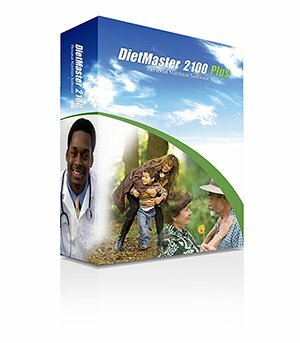 DietMaster 2100 and other DietMaster products are not intended to replace the expert advice of a medical practitioner and are not designed to treat diseases of any kind. 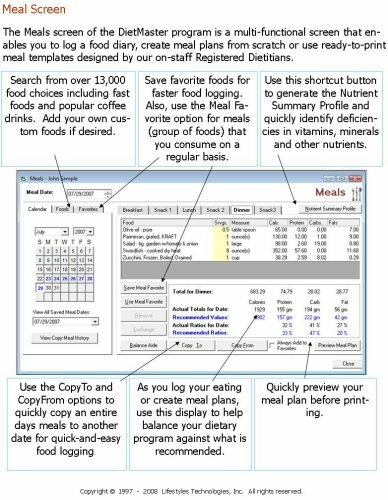 Loaded with ready-to-print cancer prevention meal plans & grocery lists. Log food intake and log exercise to calculate calorie consumed vs. burned. 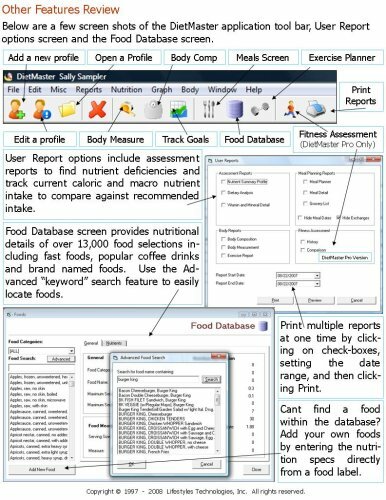 Food database contains 13,000 selections including fast foods and coffee, or add your favorites. Keep track of body symmetry measurements, body weight and body fat. Rank and track your overall fitness condition with the Fitness Assessment Module.